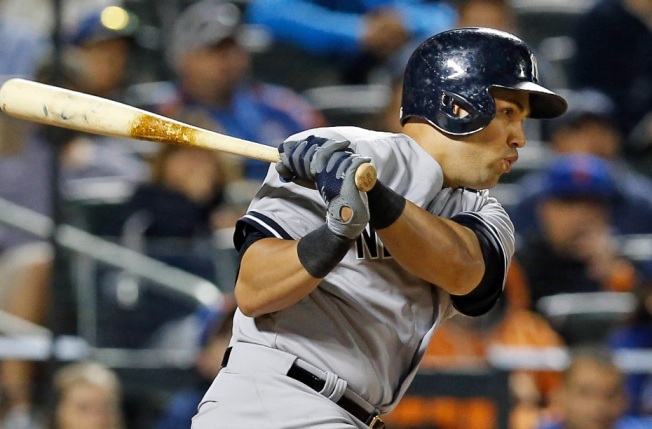 Yankees right fielder Carlos Beltran belts a two-run double in the sixth inning. Carlos Beltran, CC Sabathia and the New York Yankees took advantage of Matt Harvey's early exit, beating the sloppy Mets 11-2 Sunday night to tighten the AL East race just in time for a critical trip to Toronto. Dustin Ackley hit a three-run homer after Beltran's go-ahead double, and Sabathia (5-9) won for the first time since July 8 as the Yankees took two of three at Citi Field to win both Subway Series this season. New York, which leads the wild-card standings, moved within 2 1/2 games of first-place Toronto heading into a three-game set beginning Monday night. Harvey looks fully healthy, but was pulled for Hansel Robles (4-3) after five scoreless innings. The Mets are limiting Harvey's workload down the stretch even as they try to close out an NL East championship.